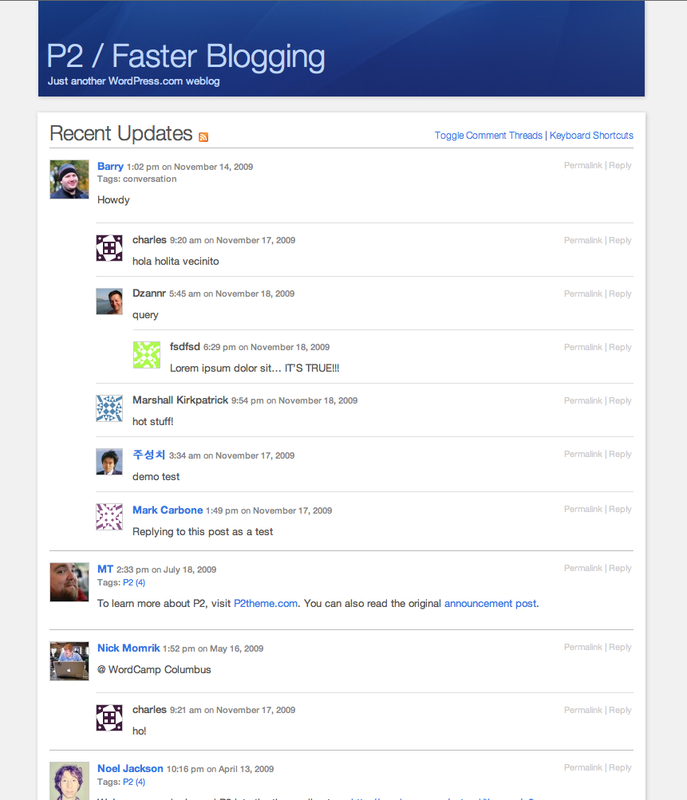 For those of you who haven’t yet tried it, P2 is an awesome micro blogging theme with quick front end posting, live ajax updating, and inline threaded comments. It already packs a big punch. So how can an already great theme be taken to the next level? That was the task of Team 34 at this year’s Automattic retreat. One of the first areas we thought could be improved was the ease of customization. Most people like to add their own personal touch to a theme, currently P2 is hard to customize beyond the standard design. We’ve added new options to allow you to hide the sidebar and even set a unique header image. All these options allow you to personalize your own P2 to match your tastes. We’ve also introduced post types into P2. Now you can post different types of content and have them formatted and displayed in a way that fits the content beautifully. There are settings for standard posts, single images and galleries, as well as links and quotes. Selecting which post type to use is as simple as clicking the correct tab above the post box. We also decided to go a step further and rework P2 so that it could easily be used as a parent theme and extended with child themes. This will allow theme designers to create awesome new theme designs without having to duplicate all of the existing P2 features. We’ve streamlined the HTML of the theme so that it is much more flexible for creating new designs using CSS. We’ve also added a large number of template based hooks that will allow plugin developers to hook into the theme and output extended functionality. The new P2 theme is now live on WordPress.com, and also available for download from the WordPress.org theme repository. However for .org users, P2 requires WordPress 2.9 beta or greater. We all love personal touches! 🙂 Thanks. Sweet. I’d like to be able to customise the iNove theme, but still, I may try this one out for a month. Great improvement on the existing theme! I will surely test it. The need of the hour, however, is a magazine theme that among other things will display the categories link in the nav bar along with the page links. It’s stuff like this that makes me want to get a dedicated WordPress.org host, so I can craft my own theme, a combination of Journalist and great themes like this one. Not my style, but it seems cool! Does this work a bit like a twitter feed then? The latest additions to WordPress are quite impressive! Thank you very much! I’d check it this very moment if I could; clients call. So breakneck speed, tomorrow AM. how can i use it in my blog? Great! I really liked the theme but I like doing posts not status updates. Great update! Full blog posts are also possible using the new “blog post” tab. Oh my gosh!!!! This is just amazing. I am loving this P/2. What a time saver. Thank you!!!!! I will tweak my design tomorrow but the layout is the best ever. Love the readability, style, ease of posting, especially replying—just incredible. Love it—big hugs!!! hmm? it doesn’t matter, does it? this feature not for me. I will take time to get into this! I’ll have a look but I’m new to this and am struggling as it is. Takes me abit of time to get the grey matter going. Excellent update, thanks for continuing the development of the best WordPress theme out there. Couple more steps and Twitter has an open, standards based competitor. This is a nice touch. I need to take a closer look. Thanks for adding new features! Is it ready for download for us, wordpress.org users? Floating image captions are rendered a bit funny in Safari and Chrome (and maybe other browsers too, I haven’t checked). Very cool and I like that you can create child themes. Themes are OK – but given that it’s content and the ability to organize it that’s important, I’d really like to see something like an easy way to crosslink posts to later related posts without having to edit each one. That would be handy for all those novel-writers too. I can’t get the header to set it’s height without repeating the pic. I’ve inserted no-repeat or solid and neither works. Do I need to try the whole image url in that css too. I was hoping it was just automatically expand the image I had selected from the custom header theme page and do it without repeating the pattern. Any word on when it will available on wordpress.org? VERY nice theme! Is there (1) a help file for styling it or (2) a way to get it to handle large images imbedded in a post (my current ones disappear)? I like this theme so mush and used it for my blog. Thanks. Think you folks might release a 3-column version of it? I’m finding that I need a 3-column theme and the options are kind of sparse. This will be a well received theme by micro-bloggers. Well done. I’ll check it out now, must be cool..
mmmm it’s also possibile to post via mail even using “micro-blogging”? 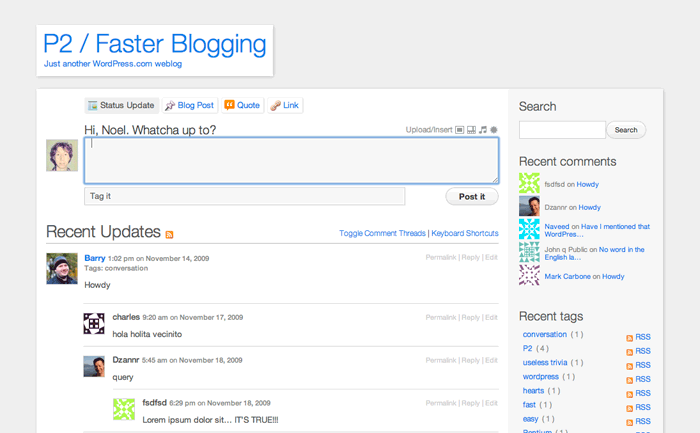 Fantastic job of building a very tweeter-like micro-blog theme! I’m definitely testing this one out. Thanks a lot! I’m tired of these “twitter” inspired blog templates, I wish someone would create some new ones with more graphical elements or with customisable header images. We have too many of the same template with different versions. Sandbox has 3 for goodness sake! We’re working to add more! The problem with floating images is there regardless if you have image captions or not. I’m using this P2-theme and have the same problem. Something has been tecnical wrong with the texts in my blog since the updates. Hope it can be fixed/adjusted in some how? I can’t even figure out how to categorize….God, I am way behind. Love the idea! Finally, something new…..
the P2 looks like face book, it will make it amazing. I’ll be refreshing wordpress.org theme depository every second…now when exactly is it being released there? Not my style. I’ll be staying with my older version, thanks but no. Not for me. Those who like it, go for it. This is a GREAT service that is going to become son a new standard of communication. Nice feature. I’ll try it! I really like P2. Please bring the new version to wordpress.org users! cool! i’m curious bout it. This is bloody awesome! So changing my site’s theme now. You guys are ace! Now all my doubts and misgivings about migrating to tumblr have died a quick death. Cannot. Thank. Enough. Where can I download this theme???? The updated P2 will be available in the WordPress.org Theme Directory soon. Nice theme. But, at this time I’ll stick with my old theme. You guys should make a Vigilance 2.0! Vigilance is my favorite theme, but it needs some upgrades. I think it will be something to check out. Cool I will have to check this one out! Looks cute. But I’m stying with my older version as well. wow, an official “twitter” theme by wordpress. amaaaaazing! Good theme. I like that! Cool! I always love a theme which has place for quick comment like that. I’ll try it, thanks a lot ^^! It would be great if it is related to the Twitter Account, then a mix of blogging and tweeting can be brought together. Sometimes we need to say something small, sometimes something needs more text. Any ETA on this, Andy? I’m champing at the bit — coincidentally I just launched a tool for a community I run using the previous version of P2 and had to hack in a lot of the things that the new version includes. Sigh.